What do we accomplish? We are Catholic Evangelizers Do we have an Imprimatur? ALL VIRTUAL RETREATS Find God In Times of Waiting Holy Land Virtual Pilgrimage The Healing Wounds of Jesus Intimate Conversation With Jesus God's Message For You: You're Beautiful! What is our Mission & Vision? Do we have an Imprimatur? 1995 "Do Whatever He Tells You"
God's Message For You: You're Beautiful! 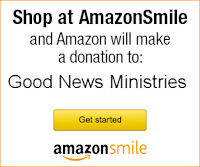 The AmazonSmile Foundation will donate to Good News Ministries 0.5% of the purchase price from AmazonSmile purchases. You will see products marked “Eligible for AmazonSmile donation” on the product detail pages. AmazonSmile.com is the same as Amazon.com: Same products, same prices. 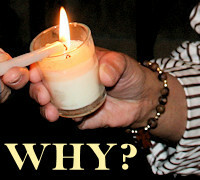 Use this graphic or link to benefit Good News Ministries: smile.amazon.com/ch/65-0604838. Or log onto smile.amazon.com and select Good News Ministries of Tampa Bay as your charity of choice. 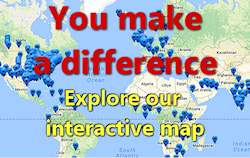 Spread the Good News Reflections using our widget on your website or blog. As a benefactor, you help us strengthen the faith of others. Together we’re changing hearts for Christ! Good News Ministries of Tampa Bay is a non-profit (IRS 501C3) in the United States of America. Financial donations by U.S. citizens might be fully deductible for federal tax purposes, under section 170 of the 'Internal Revenue Code'. Good News Ministries will never distribute your info. Most photos © Terry Modica. All rights reserved. See our Copyrights Page for permission. Good News of Divine Mercy? This is NOT it! Here's his info.